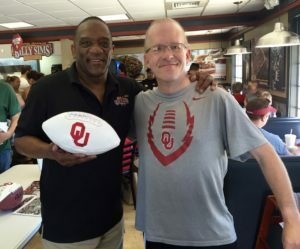 Former OU running back and now restauranteur, Billy Sims spent the day meeting fans at his new Billy Sims BBQ restaurant in Newton on Saturday, July 16. 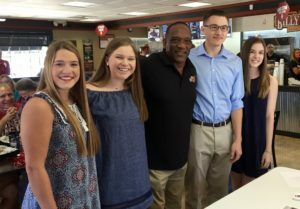 Sims spent four hours signing autographs and posing for pictures as folks from the area dined on great food. 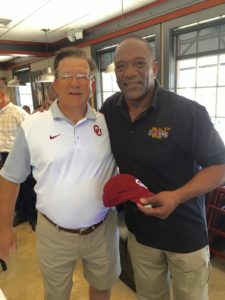 Billy Sims and Bill Wilson from the Wichita Business Journal. 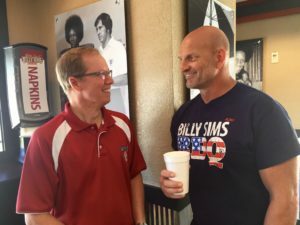 Board member Brian Latta and franchise owner David Dunn take a moment during the grand opening. 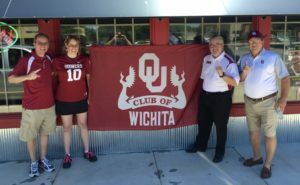 OU Club of Wichita board members flying the colors. The day was made even more special with the introduction of the club’s 2016 scholarship winners. 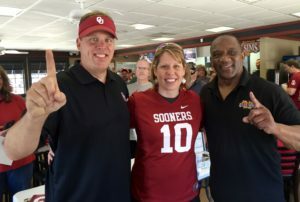 Shown here with Billy are Ashley Lesser (Kapaun Mt. Carmel), Mary (Molly) Wallace (Kapaun Mt. Carmel), Scott Tesser (Rose Hill), and Allison Herreen (Andover).